From Lucio Fulci, the godfather of gore (The Psychic, The Beyond), comes one of the most powerful and unsettling giallo thrillers ever produced: his 1972 masterpiece Don't Torture a Duckling. When the sleepy rural village of Accendura is rocked by a series of murders of young boys, the superstitious locals are quick to apportion blame, with the suspects including the local "witch", Maciara (Florinda Bolkan, A Lizard in a Woman's Skin). With the bodies piling up and the community gripped by panic and a thirst for bloody vengeance, two outsiders - city journalist Andrea (Tomas Milian, The Four of the Apocalypse) and spoilt rich girl Patrizia (Barbara Bouchet, The Red Queen Kills Seven Times) - team up to crack the case. But before the mystery is solved, more blood will have been spilled, and not all of it belonging to innocents... 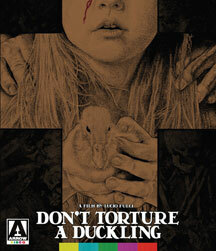 Deemed shocking at the time for its brutal violence, depiction of the Catholic Church and themes of child murder and paedophilia, Don't Torture a Duckling is widely regarded today as Fulci's greatest film, rivalling the best of his close rival Dario Argento. Arrow Video is proud to present this uniquely chilling film in its North American high definition debut. Fulci's hands-down best movie, and a scary as hell flick... Deeply troubling, effective, and oddly beautiful. A really fascinating combination of giallo tropes with a rather trenchant undercurrent of social (and, yes, religious) criticism that certainly indicates Fulci was more than just the 'godfather of gore'. With an understanding of the immense technical challenges this restoration required, technical merits are strong, and as is often the case with Arrow releases, the supplements are outstanding. Recommended. This is a fantastic set that should please Fulci and Giallo fans with its excellent transfer and supplements. Don't Torture a Duckling is a fascinating film... Truly something special. Arrow Video's Blu-ray release is the definitive presentation of the film. Highly recommended for both Fulci fans and film fans alike. A genre landmark lovingly restored and buttressed with scads of supplementary features, Don't Torture a Duckling is a DVD Talk Collector Series title.